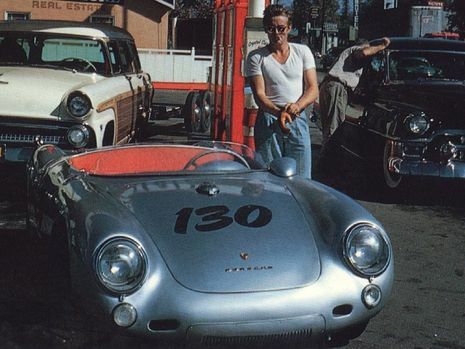 On September 30, 1955, Dean and his Porsche factory-trained mechanic, Rolf Wütherich were at Competition Motors in Hollywood preparing Dean’s new Porsche 550 Spyder for the weekend sports car races at Salinas, California. Dean originally intended to trailer the Porsche to Salinas, behind his 1955 Ford Country Squire station wagon, driven by friend and movie stunt man Bill Hickman and accompanied by professional photographer Sanford H. Roth who was planning a photo story of Dean at the races for Colliers Magazine. Because the Porsche didn’t have enough ‘break-in’ miles prior to the race, Wütherich recommended that Dean drive the Spyder to Salinas to get more ‘seat time’ behind the wheel. The group had coffee and donuts at the Hollywood Ranch Market on Vine Street across from Competition Motors (not the legendary Farmer’s Market at W 3rd St & S Fairfax Ave as previously reported) before leaving around 1:15 p.m. PST. They stopped at the Mobil station for gasoline on Ventura Blvd. at Beverly Glen Blvd. in Sherman Oaks around 2:00 p.m. The group then headed north on CA Route 99 and then over the ‘Grapevine’ toward Bakersfield. At 3:30 p.m., Dean was stopped by California Highway Patrolman O.V. Hunter at Mettler Station on Wheeler Ridge, just south of Bakersfield, for driving 65 mph (105 km/h) in a 55 mph (89 km/h) zone. Hickman, following behind the Spyder in the Ford with the trailer, was also ticketed for driving 20 mph (32 km/h) over the limit, as the speed limit for all vehicles towing a trailer was 45 mph (72 km/h). After receiving the speeding citations, Dean and Hickman turned left onto Route 166/33 to avoid going through Bakersfield’s slow 25 mph downtown district. Route 166/33 was a known short-cut for all the sports car drivers going to Salinas, called ‘the racer’s road,’ which took them directly to Blackwells Corner at CA Route 466 (later SR 46). At Blackwells Corner, Dean stopped briefly only for refreshments and met up with fellow racers Lance Reventlow and Bruce Kessler, who were also on their way to the Salinas road races in Reventlow’s Mercedes-Benz 300 SL Coupe. As Reventlow and Kessler were leaving, they all agreed to meet for dinner in Paso Robles. At approximately 5:15 p.m., Dean and Hickman left Blackwells Corner driving west on Route 466 toward Paso Robles, approximately sixty miles away. Dean accelerated in the Porsche and left the Ford station wagon far behind. Further along on Route 466, the Porsche crested Polonio Pass and headed down the long Antelope Grade, passing cars along the way toward the junction floor at Route 466 and 41. Dean spotted a black-and-white 1950 Ford Custom coupe, driving at a high speed heading east on Rt. 466 toward the junction. The time was approximately 5:45 p.m., PST. Its driver, 23-year-old Cal Poly student Donald Turnupseed, suddenly turned in front of the Porsche to take the left fork onto Route 41. Turnupseed then hesitated as he 'spiked' the brakes just as the Ford crossed over the center line. Dean saw an impending crash and apparently tried to 'power steer' the Spyder in a 'side stepping' racing maneuver, but there wasn't enough time or space as the two cars crashed almost head-on. The Spyder flipped up into the air and landed back on its wheels off in a gully, northwest of the junction. The sheer velocity of the impact sent the much-heavier Ford broad-sliding thirty-nine feet down Route 466 in the westbound lane. According to a story in the October 1, 2005, edition of the Los Angeles Times, California Highway Patrol Captain Ernest Tripke and his partner, Corporal Ronald Nelson, had been finishing a coffee break in Paso Robles when they were called to the scene of the accident at the Route 466/41 junction. 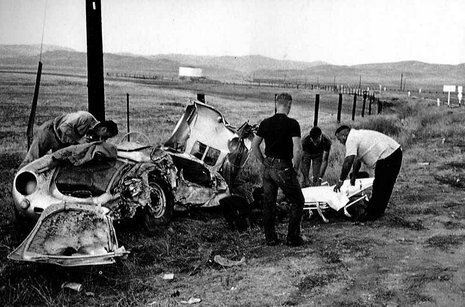 Before Officers Tripke and Nelson arrived, James Dean had been extricated from the Spyder's mangled cockpit, his left foot had been crushed between the clutch and brake pedal. Dean was severely injured as he took the brunt of the crash with a broken neck and several internal and external injuries. Nelson witnessed an unconscious and dying Dean being placed into an ambulance; and a barely conscious Wütherich, who had been thrown from the Spyder, was lying on the shoulder of the road next to the wrecked Porsche. Dean and Wütherich were taken in the same ambulance to the Paso Robles War Memorial Hospital, 28 miles away. Dean was pronounced dead on arrival at 6:20 p.m. PST by the attending emergency room physician, Robert Bossert. Wütherich survived with a broken jaw and serious hip and femur injuries that required immediate surgery. Turnupseed was only slightly injured with facial bruises and a bloodied nose. After being interviewed by the CHP, Turnupseed hitch-hiked in the dark to his home in Tulare. Hickman and Roth arrived at the accident scene approximately ten minutes after the crash. Hickman assisted in extricating Dean from the wreckage. Roth took photographs of the accident scene, which are now owned by Seita Ohnishi, a retired Kobe, Japan businessman. 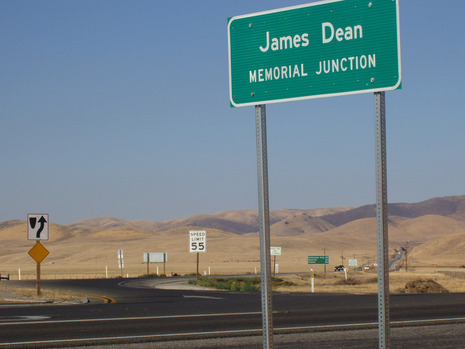 Ohnishi, in 1977, designed and erected a stainless steel memorial in tribute to James Dean at Cholame, just a mile west of the accident site. Some sources give Dean's last known words—uttered right before the impact when Wütherich told Dean to slow down when they both saw the Ford Custom coupe about to pull into their lane—as "That guy's gotta stop... He'll see us." James Dean historian Lee Raskin believes that this is pure conjecture about Wütherich saying anything to Dean, or Dean saying anything to Wütherich prior to the crash. According to the Coroner's deposition taken of Wütherich in the hospital, and later in a 1960 interview given to an official Porsche magazine, Christophorus, he couldn't recall any of the exact moments leading up to and after the crash. 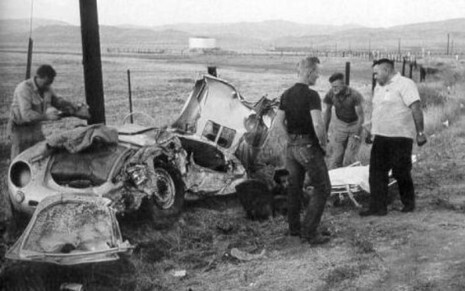 At the Official Coroner’s Inquest, held at the San Luis Obispo Court House on October 11, 1955, Turnupseed told the jury that he did not see the low-profile Porsche until after he was turning left onto Route 41. After other testimony by the CHP, and witnesses to the accident, the coroner's jury retired to deliberate. It came back with a verdict of "accidental death with no criminal intent" finding Donald Turnupseed not guilty of any contributory wrongdoing in the death of James Dean. The deceased Dean was also found not guilty of any criminal intent or contributory wrongdoing for the accident. Although not charged with (what could have been) vehicular manslaughter, Turnupseed had nevertheless been dealt a devastating blow that would haunt him for the rest of his life. "Not only was he involved in an accident that resulted in one man's death, but it was a death that will never be forgotten, a death whose reverberations are still being felt all over the world." Turnupseed granted just one interview to the Tulare Advance-Register newspaper immediately following the crash, but after that he refused to speak publicly about the accident. Turnupseed went on to own and operate a very successful family electrical contracting business in Tulare. He died at the age of 63 from lung cancer in 1995. Wütherich, after having several complicated surgeries on his hip and femur, went back to West Germany in 1957 with psychological and legal problems. He worked with the Porsche Factory's testing department and international rally and racing teams during the 1960s. Wütherich was one of the first employees of Porsche and worked for the factory eighteen years before being terminated. He died in July 1981, in Kupferzell, West Germany, in another auto accident when he lost control of his car and crashed into a residence. Like James Dean in the previous crash, Rolf Wütherich had to be extricated from the wreck and died at the accident scene. He was 53 years old. There is an ironic epilogue to James Dean's fatal crash in 1955: while filming Giant, Dean also filmed a short Public Service Announcement (PSA) with actor Gig Young for the National Safety Council. It featured James Dean dressed as the young Jett Rink talking about how driving fast on the highway can be more dangerous than racing on the track. It ends with Dean, instead of saying the popular phrase "The life you save may be your own" he humorously ad-libbed, "The life you might save might be mine." This legendary black and white PSA, released following Dean's death, can now be viewed on YouTube.